Wednesday we hiked in warm temperatures, almost too warm, but not terrible. It's just hard to go from cool to hot so quickly. We were on roads all day long. I know that probably sounds unpleasant, but it isn't really. The roads are little traveled, and you often get views, because the trees don't close everything in. 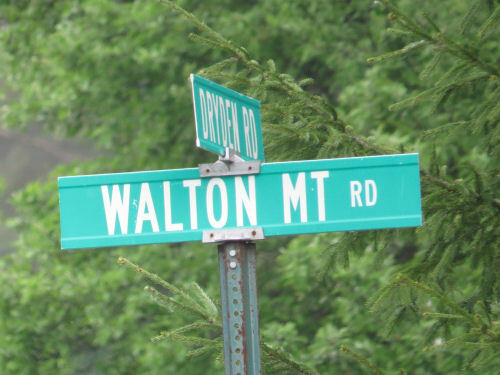 Can you guess that we walked over Walton Mountain? It was 1200 feet up, but the grade wasn't bad, and it turned out to be a really easy day at 8.2 miles. We were actually done by noon. 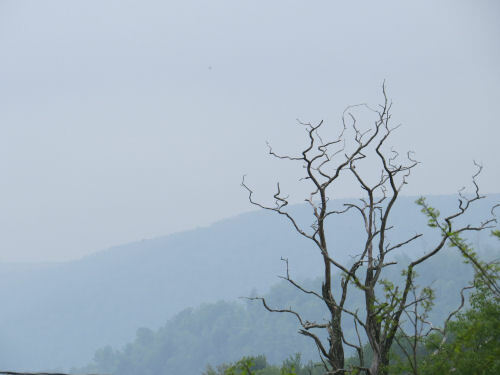 The day was hazy, so views were muted, but with a beauty of their own. 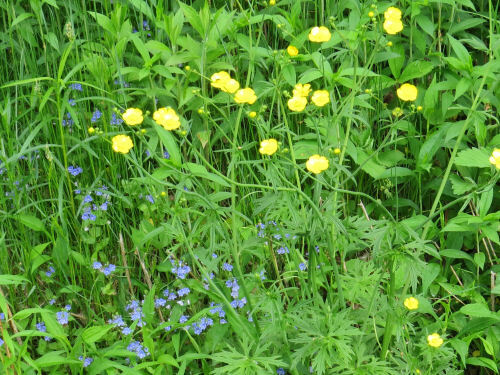 Two of my personal roadside favorites- yellow common buttercup and birds-eye speedwell. We were not sorry to finish hiking quite early. 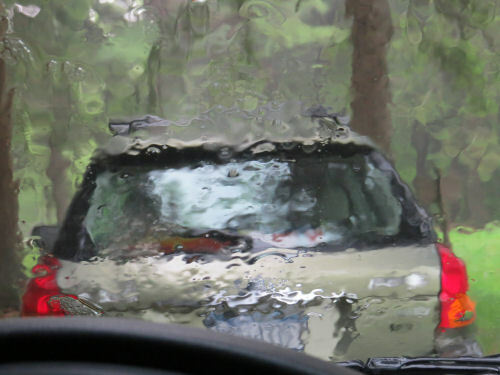 We spent part of the afternoon sitting in the cars waiting out a downpour. But the evening cleared up, and the geese brought their brand new babies out for a first swim. OK- gotta head to work fast! Bye. 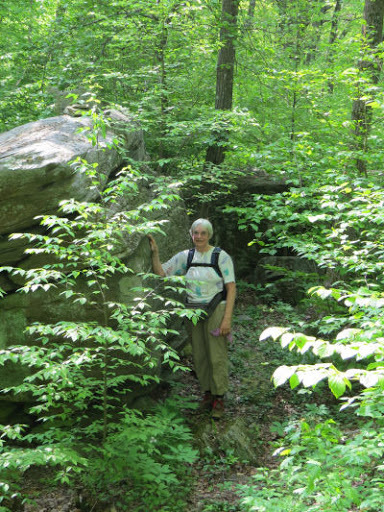 See FLT Hiking - Barbour Brook Rd to Fletcher Hollow Rd. Tuesday was our hilliest day as far as going up and down and up and down and... None of the hills seem to have names, but we did a total of 2200 feet of vertical climbing and about 2100 going down, over 9.1 miles. It wasn't as hard as I expected, actually. The weather remained nice. 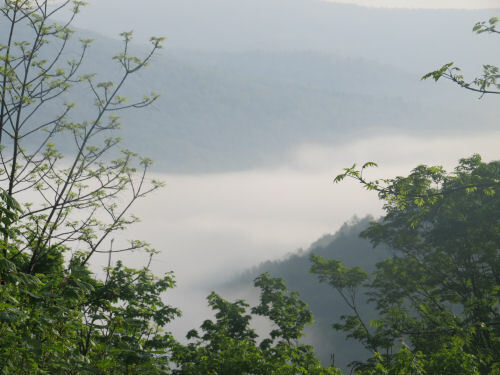 In the morning, the fog was hugging the valleys. This is the Delaware Valley that I showed you yesterday, but early on Tuesday it was filled with white froth. After we started hiking it was again mostly in the woods without long vistas. 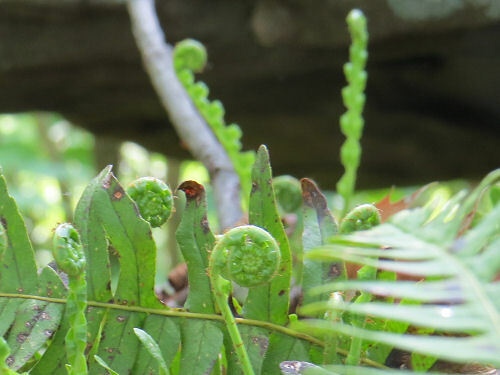 We concentrated on little green treasures like Chain Fern, still not fully open. 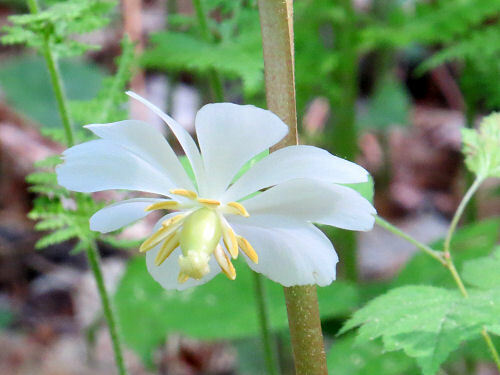 The Mayapples agreed to bloom in May, this year. We occasionally walked past rich patches of them. The blossoms hide beneath the leaves. One of the high spots (literally!) 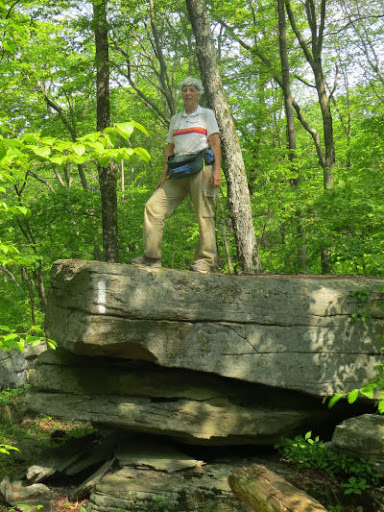 was a place called Rocky Point where the trail winds between scattered rock outcroppings and glacial leavings. Marie likes to stay solidly on the trail. But you know I couldn't resist getting up to the top, right? We finished in plenty of time to get a hamburger at the local deli for dinner and return to camp in time to read and play our word game, which we love. The evening light on Launt Pond was a lovely backdrop and ending to day two. 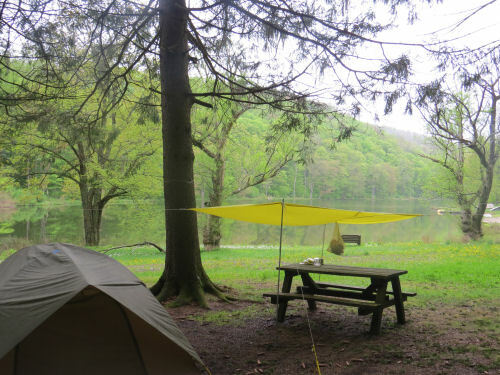 Marie and I met at the Launt Pond campground on Bear Spring Mountain on Sunday evening. The scenery in the area is stunning! 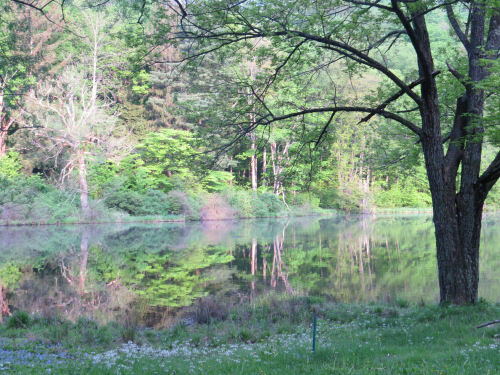 This picture is a view up the valley of the East Branch of the Delaware River, near Walton, NY. This was taken from the road, not while hiking. I love the steepness and closeness of the hills. 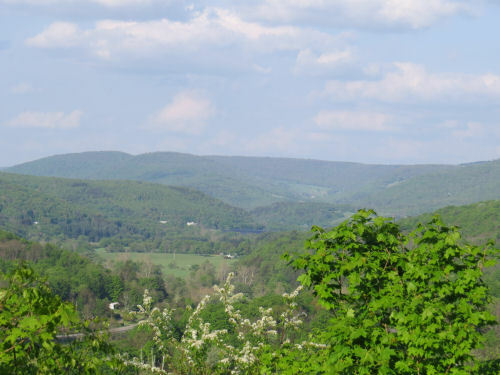 This is the western edge of the Catskills, which are usually called mountains. We set up the campsite in a site right on the small lake. During the week- before the holiday, we had the campsite to ourselves. 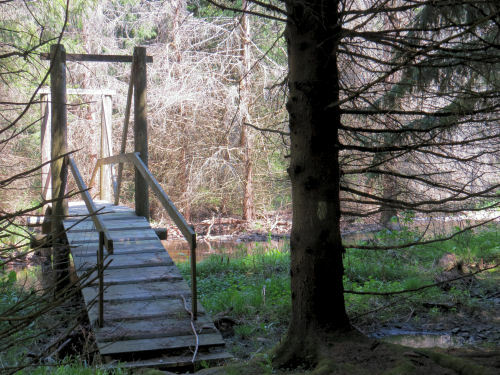 On Monday, we spotted one car, and went to where we ended last year's hike, FLT Hiking - Masonville to Shear Rd. Heading into the woods! 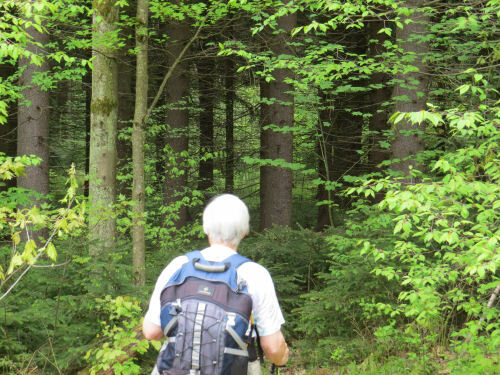 The day's walking was all in close woods. I like the intimacy of that, but it eliminates vistas. There are always other perks. 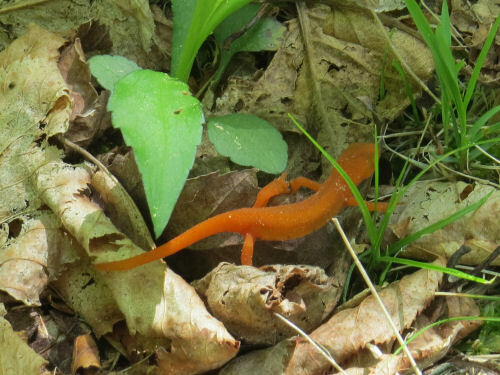 We love the little red efts. We saw 25 of them over the course of the hike, but this was the first. 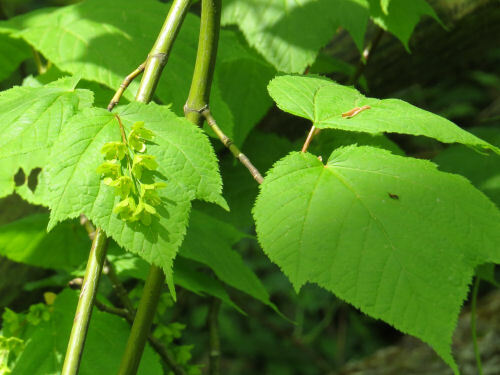 One of our favorite trees is the Striped Maple, or Moosewood. This is the flower. 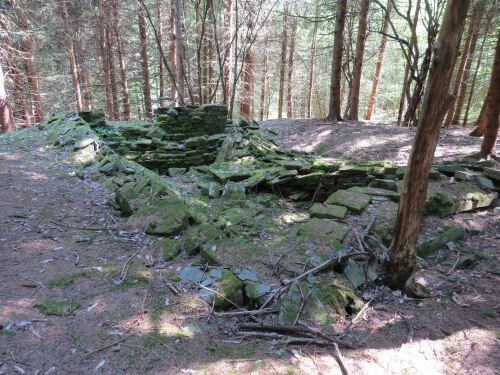 The woods of New York are littered with broken down stone walls and foundations of former homes and barns. This is one of the most complete we saw. It's always interesting to think about who lived here. The homes are usually near the tops of hills, and sometimes you can determine the old roads to them because they are lined with stone walls or rows of maples that were planted. I ponder how hard it must have been for the horses to pull wagons up those steep hills. The clearings the settler must have made for crops, gardens, or pastures have long since grown over with woods. Sometimes newer structures are welcome too. This is an Eagle Scout project- a bridge over Cold Spring Creek. We were happy to keep our dry feet. This was built by Derrick Mott. This was a relatively short day with only 6.7 miles. As it turned out, we would have had plenty of time to hike more, but we didn't want to crowd ourselves, so we planned for a short first day. I'll give you one more day for guesses on the baby birds from yesterday. These trips to New York become so rushed, as I try to visit other friends at the ends of hikes. Even so, it's nice to see people even for short times. I was at Irene's house for 21 hours, and we slept some of them. Irene maintains a lot of miles of trail, so we went out to do some trail work yesterday afternoon. 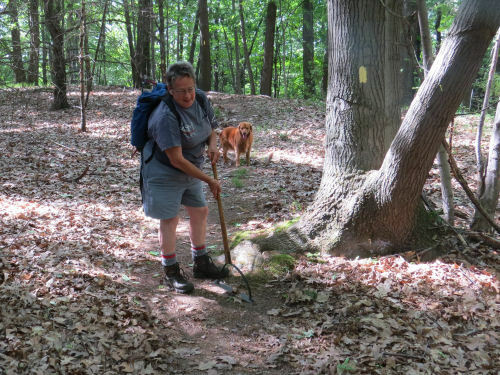 Here she is flipping some sticks off the trail. Her dogs, Sandy and Pearl, are a little younger than Maggie was, but are also aging. It's so hard to see dogs get old. But they still love to cool off in any pond, and here they found a young friend to throw sticks. Finally, I have a guessing game for you. These are baby birds. Not exactly the cutest ones on the block, but quite a common one. 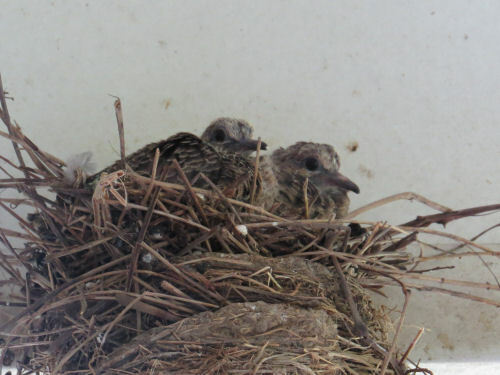 Who do you think nested on Irene's porch? Tomorrow I'll start going through the days of the hike. Haven't even looked at all the pictures yet, myself! This post is just to let you know I'm alive and well. The real hiking story will be told after I return home. This is an addition to the flamingo series. We passed a lovely garden on one of the road walk sections. 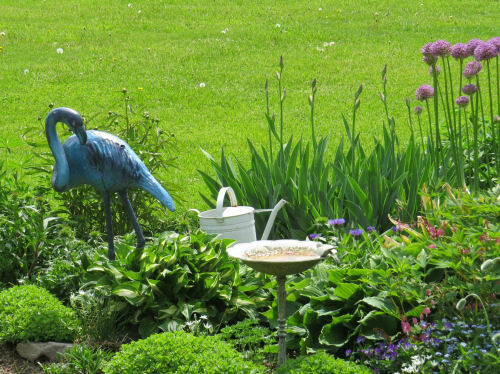 As we approached, I thought there was a nice blue heron garden ornament. Nope. It's a blue flamingo! I made it to NY, not as fast as some trips, but no big hold ups. I'm with Elaine tonight. No pix, maybe tomorrow. The trees were blooming all the way- wild cherry, lilacs, redbud, other fuzzy things I couldn't ID at 60 mph. Caught the Buffalo skyline in the afternoon sun- hope one of those pictures turns out. Saw a shooting star. Drove past the house where I grew up. Tired, but all is good. Do you remember this picture? It's the main control panel at the newspaper stuffing machine. I got to be the one who operated it for a while today! It didn't last long. The machine was running horribly. I was there for less than an hour, and I got shuffled to watch the papers on the moving table and clear the belts when they jam. That was ok too. Now that I know how to run the control panel, I know they might let me step in there from time to time. I leave for New York tomorrow morning. Am I ready? No. Am I too tired to care tonight? Yes. I think I have to go to bed early and get up early. Now that the blog networks that rewarded daily posts are gone, I won't be going out of my way to schedule posts ahead of time. If I am able to make a post on the road occasionally, I will. Otherwise... just be confident I'm having a good time, and I'll update you when I can. I expect you'll see something tomorrow and Sunday, but after that... who knows? Two Briar Hills- It's So Confusing! I've been meaning to show you this for a couple of weeks. Talk about confusing. 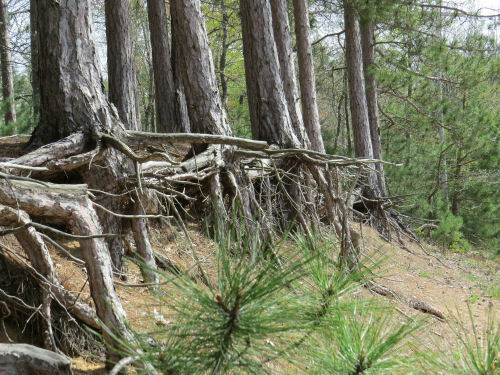 Remember that Ellen and I climbed the highest hill in the Lower Peninsula of Michigan, and it is named Briar Hill? There is another Briar Hill just a couple of miles north of the other one! First, some pictures, then I'll explain... although the explanation doesn't solve the confusion. 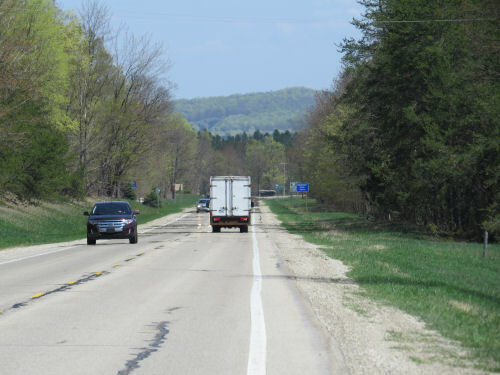 I was driving SE on M-115 and saw a single pointy peak in the distance. It's odd, because it's all alone. It didn't look the right shape for Briar Hill (the one we climbed). 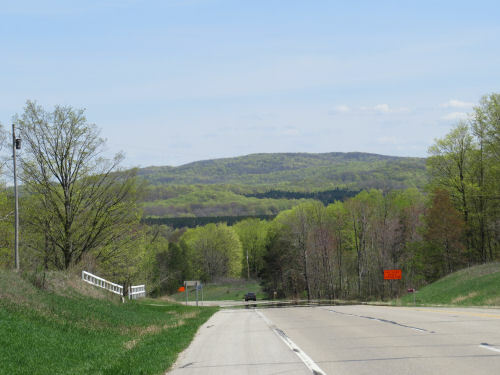 Just a couple of miles farther on the road, and this range of hills came into view. This looks more the right shape for the Briar Hill high point. When I got home and looked at the map they are both named Briar Hill. Hmmm. Had to do a little more research. First of all, let's be clear. The one we climbed is higher. Quite a bit higher. It's 1706 feet, and the pointy peak is only 1300. On this map, you can see the two hills. 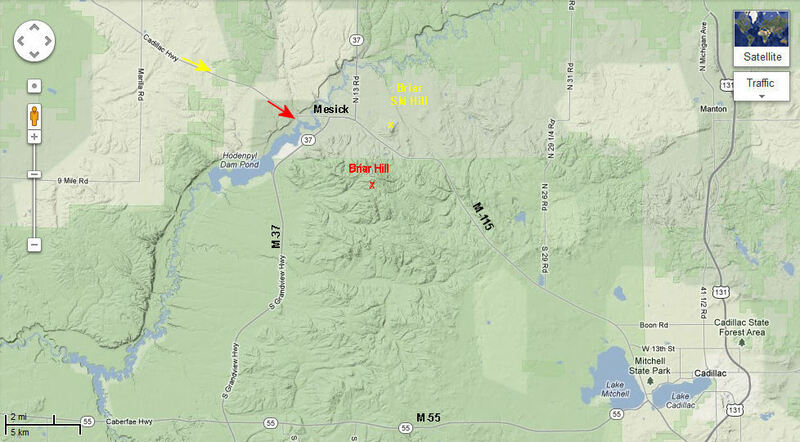 The arrows that match the colors of the Xs are the approximate locations where the pictures were taken. You can enlarge the map. Here's what I found out. The pointy peak is the location of a former commercial enterprise called Briar Hill Ski Jump. Now things make sense. Someone just decided that was a good name for the ski runs. But it's still really confusing to look at the map and see two peaks named Briar Hill. Guess what I'm going to be doing next week. It's the May hike with Marie. 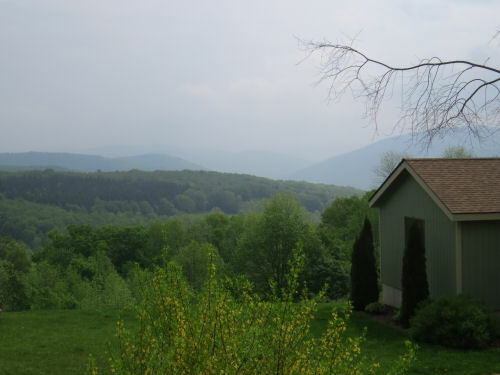 We'll be in the Catskill Mountains of New York. I have way too much to do in order to be able to leave here on Saturday, but I'm on a mission. 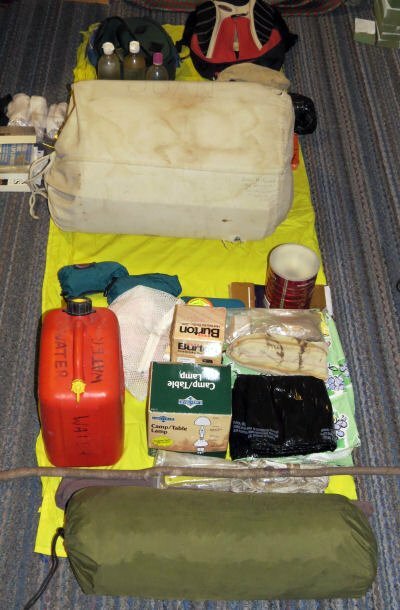 Today, one of the jobs was to check in the camping equipment and make sure it's in good condition. I was out doing assignments today, and saw several interesting things, but I think this one wins for tonight. I came around a corner on a dirt road and was facing this line of trees. 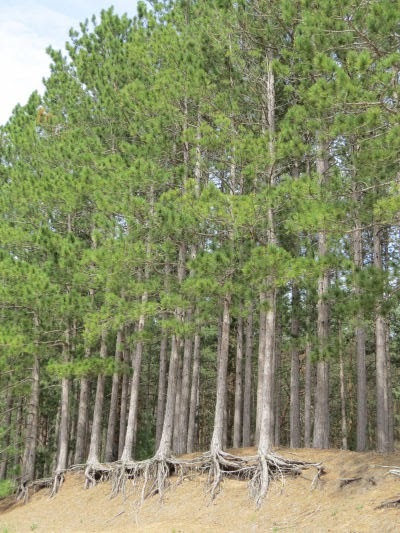 Red pines. The traffic and the wind are working hard to create a blowout on that corner. 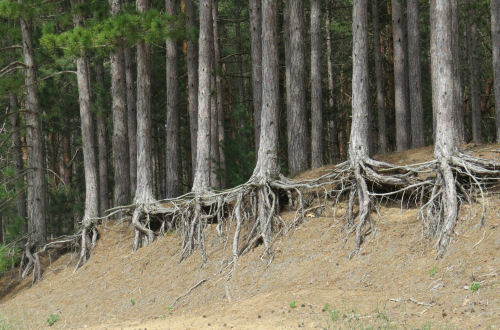 The trees are holding hands and digging in their heels to hang on despite the difficulties. Unless, perhaps, they are simply woody can-can dancers poised in mid-step.